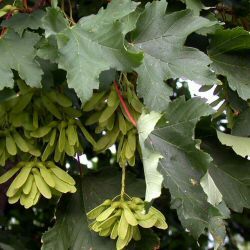 A well-known, very durable tree, Sycamore (Acer pseudoplatanus) is a native tree to Central Europe across to the Caucasus region. It has been widely planted in Britain and is particularly suitable for planting in exposed coastal areas. Expect a final height of 35m (117ft). Typically, Sycamore is planted in groups of between 10 and 25 trees. This number of trees is ideal for creating a wildlife habitat and a meaningful source of food and shelter. Spacing may vary between 1m (3ft 4in) and 5m (16ft 8in). The aim is to mimic what nature intended and thus avoid artificial lines. Blending of one species into another is suggested although bearing in mind different growth rates.